Nearly a year before the 2015 General Election, the Chancellor George Osborne announced that the country needed a ‘Northern Powerhouse’: an attempt to bring together the North’s 15 million strong population into a collective force that could begin to rival London and the South East as the economic heartbeat of the UK. It followed the signing of an historic deal in November 2014 between Osborne and the leaders of Greater Manchester Combined Authority that devolved powers over transport, housing and policing from Westminster to local government on the condition of a directly elected mayor. It may not sound significant but for many reasons it was: it represented a real shift of power from central to local, set the precedent for similar deals with cities and regions outside of London, and (perhaps most significantly) saw a group of Northern Labour councillors strike a deal with a Tory Chancellor. Those who think the ‘Northern Powerhouse’ is little more than a sound bite may have a strong case. But what can’t be denied is that for the first time in a generation, arguably more, local governing structures possess considerable power and responsibility to reform public services from the ground up, and the tense relationship between central and local government seems to have found a new environment in which both can work and collaborate. Westminster is finally beginning to relinquish power and return it to the local. However, as Simon Parker points out in Taking Power Back, the devolution deals are of the ‘tamest sort’. They are not accompanied with any responsibility for taxation and in comparison with other countries, from the US to Albania, they pale in insignificance as we are one of the most centralised nations in the world. British centralism has dominated policy making for too long and while the deals are a start, there is a long way to go. 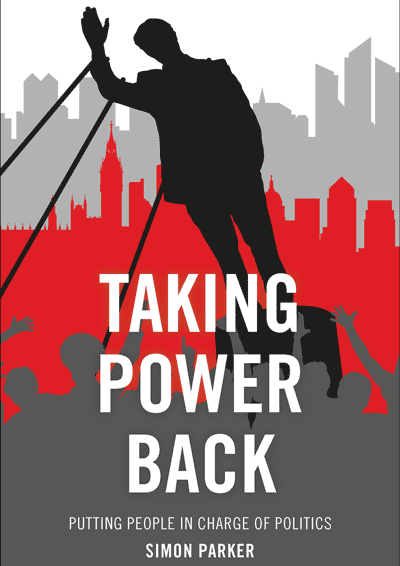 Taking Power Back offers not only a brilliant analysis of how we became a centralised nation but also a blueprint for how we can create a brighter future that places people at the heart of politics, values personal relationships and provides the space and support for the commons to flourish. The post-war centralised experiment has not only failed to create better public services, it has robbed the people of power and broken down trust between state and society. It does not take an academic, policy expert or political commentator to see there exists an unhealthy disconnect between our elected representatives and the people they serve. As Simon argues, politics has become “a game that is played out in the media a long way from the lived experience of most people’s everyday lives.” Only 17% trust politicians, generation X and Y are disillusioned with the state, and the old model of change, led by national political parties and ‘catch-all’ leaders, is creaking. His critique of ‘top-down politics’ is spot on. Centralism is sometimes necessary but its dominance has not lead to overall better outcomes. In the UK today, we have some of the lowest levels of social mobility in Europe, the performance of our NHS varies place to place and we should be ashamed at lack of affordable housing. An obsession with targets and standards set in Westminster has taken the focus away from the wellbeing of the citizen. When failure is highlighted and scandals occur the centre must then take responsibility for everything, even when the blame lies elsewhere, fuelling mistrust not only in politicians but also in the services and the hardworking people that deliver them. Calling for the decentralisation of public services (in other words, radical reform of the welfare state) is not the same as calling for the privatisation of public services, nor is it a betrayal or divergence from progressive values. The most potent failure of centralism that Simon points to is that it ‘muddles priorities’. In dealing with missed targets or low standards the response from the centre is to tinker with the structures instead of changing society. The solution is to reorganise, so much so that between 2005-09 more than 90 government departments and quangos were reorganised to the cost of £780m. It’s no way to run a country. But it’s in another sense that priorities have been mislaid: when it comes to funding. To illustrate this, Simon uses the government’s handling of the NHS. Everybody knows that the NHS is underfunded, in fact, as he notably points out, this has been an issue since its inception. However, in the spirit of the type of change his new politics calls for, the solution to the health system’s woes is not more money, it’s us. We need to ensure the future of the NHS by supporting preventative care, taking better care of our selves and those close to us. We need to keep fit, stay out of hospital and support the elderly (dementia and loneliness are huge challenges today and will be even greater tomorrow). People, rather than money, hold the solution. What’s wrong is typified in the example that the NHS spends more money on fitting gastric bands than it does on proven programmes to drive weight loss. It’s no way to run a health service. What’s interesting about Simon is that he has been immersed in the debate about the future of our cities and public services for 15 years. In the book, he honestly admits to be being part of the ‘Blair years’ consensus that what mattered was not what government spent but what it did, and how effective it did it. The financial crisis questioned this approach; were public services actually getting better; were they being reformed or were inadequate solutions being propped up by funding; were some parts of the public sector actually contributing to social problems by creating inefficiency and dependency? The public spending cuts ignited by the Coalition Government have caused strain on public services and the citizens that depend on them. The continuation of spending restrictions until at least 2020 will see the role of government in British society significantly changed. Simon tackles this new environment head-on and rather than viewing it as an attack on ‘progressive’ values, views it as an opportunity to not just build better public services but a better society by crushing Westminster control and returning power to the people. Perhaps the most thought-provoking theme presented is his book is how ‘progressives’ and those on the left should react to this new fiscal environment and create a positive way forward. He admits to asking himself what it meant to be a Leftist ‘who felt increasing sceptical about the ability of the big, centralised state to solve problems?’, and in doing so he strikes at the heart of an issue progressives need to understand. Calling for the decentralisation of public services (in other words, radical reform of the welfare state) is not the same as calling for the privatisation of public services, nor is it a betrayal or divergence from progressive values. Rather, it is a call for better public services that are sustainable, loved and more effective in dealing with idiosyncratic problems across the country. Our solutions to poverty, inequality and health issues should always be evolving and progressives have a duty to ensure that they are too. As Simon explains, his blueprint is deeply sceptical of the ability of either state centralism or the free market to achieve better social outcomes and promote progressive values. His new politics proposes a mix of democratic republicanism and libertarian socialism to ensure true freedom and a state that provides the necessary support for people to make their own choices and flourish. Whilst you don’t have to agree with this approach, the practice of assessing one’s means but retaining one’s values is an exercise in which we should all partake from time to time. From an historical perspective, the revolution he calls for is not foreign to British soil. Using London as an example, we are shown how early 20th century experimentation in local public services became replaced by centralism through the creation of the welfare state. As he rightly attests, the Beveridge Report suggested a big role for friendly societies and trade unions in managing sickness benefits and the Labour Party battled between Bevan’s NHS from the centre and one delivered by municipalities. We are at a unique juncture in civilisation where we can learn from detailed accounts of how things were done in the past and compare to today. We should look to how society was structured in our past and where appropriate, adopt and update the models of yesterday. I sense this is a journey Simon has taken and his ideas are the more pertinent and inspiring because of it. The commons plays an indispensable role in his vision for a country that no longer depends on the failed institutions of the central state, defending the interests of communities against the demands of both government and business. New power, he argues, ‘needs to be governed at a level where interpersonal relationships can be brokered authentically’. His blueprint provides ways in which the state can bring the commons into the fold. This is a gusty book that offers a way in which the brilliant ideas and projects featured in STIR can come to life and become a crucial part of society. At the risk of sounding misanthropic, my concern is that his vision depends on us to do more, not just the readers of STIR but everyone. Perhaps this is our challenge. We must get out there and encourage others to join us. To paraphrase Simon, ‘the revolution is coming, it will won’t be easy, but it will not be centralised’.